Though many visitors to the James Farm Ecological Preserve may not realize this, this little slice of natural heaven is owned by Sussex County and managed and maintained by the Delaware Center for the Inland Bays. Preserving a wild place requires a plan- and we have one! A survey was conducted in 2012 which found that it was receiving over 10,000 visits each year – and that was number expected to grow! Thus, in 2014, a “Master Plan” was developed to maintain the site and its varied natural habitats while making sure it was safe and accessible to visitors. Now, in February 2017, you can see the process taking place! Signs of survey work (design, engineering and permitting work) have become apparent over the last month or so. This is being done for Phase One of the plan: reconfiguring the parking lot, gateway area and event lawn. The stakes and flags are visual markings for the planning process, which assure that basics such as storm-water management and traffic access are properly installed. This project is part of an Outdoor Recreation, Parks and Trails grant between The Division of Parks and Recreation and Sussex County. You may also see the clearing of some wooded area adjacent to the Green Trail and the current parking lot. This will become a “native arboretum”. In 1998, when we started managing the Farm this land was a pasture. Since then, it has been left fallow, colonized primarily by black cherry (Prunus serotina) and trumpet vine (Campsis radicans) – and though native, these plants tend overwhelm any other vegetation. So through a volunteer effort, the cherry and vine, and other less common species, are being thinned, exotic plants (primarily honeysuckle and callary pear) are being controlled, and more desirable native species (oaks, hickories, pines) that are there currently are being managed. Later stages of the project will involve planting of specimen-quality, native trees. The arboretum area will eventually feature walking paths that will wind through and showcase native forest species! It is important to note that most of the area located north and east of the Green Trail will be allowed to mature naturally, with only control of invasive exotic plants being the main management technique employed. Other areas of the farm, such as the old-growth forest on the way to the beach and meadow on the east side of Cedar Neck Road, will be managed as they are now. But please don’t worry! We often hear concerns from visitors that fear the James Farm will become a park, or be developed. But all of the improvements to the James Farm Ecological Preserve are being done not to make the Farm different, but to accommodate the increased usage that it is sure to see. The population of Coastal Sussex County has expanded dramatically in the almost twenty years of Center management of the James Farm. Usage of the Farm has increased and is certain to increase more. The Master Plan’s chief objective is to manage the property so that it remains a unique wild oasis – in an increasingly urbanized world. Bob Collins is the Program Manager at the Center for the Inland Bays. Some of his duties include: property manager for the James Farm Ecological Preserve, the Building for Our Bays, and the CIB’s boats and vehicles; program manager for the Don’t Chuck Your Shucks, Oyster Gardening programs; implementation manager for various restoration projects; staff liaison for the Water Use Plan Implementation Committee. 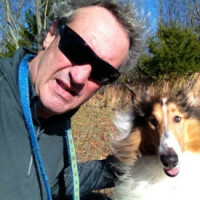 A Bethany Beach resident since 1990, he lives with his wife Kelly, daughter Carly and collie Oban. He enjoys paddling and running (with Oban) when not preaching the gospel of fishable/ swimmable bays. This entry was posted in Staff Blog and tagged ccmp, ecological preserve, james farm, master plan. Bookmark the permalink.